Another beautiful medallion pattern from Usha ! Well, it would’ve been, if I hadn’t been in such a hurry. Using some leftover threads, I managed only 6 rings to her 8. A very clever pattern and 2-colour effect ! The dot picot cluster is overlaid midways through tatting a ring. 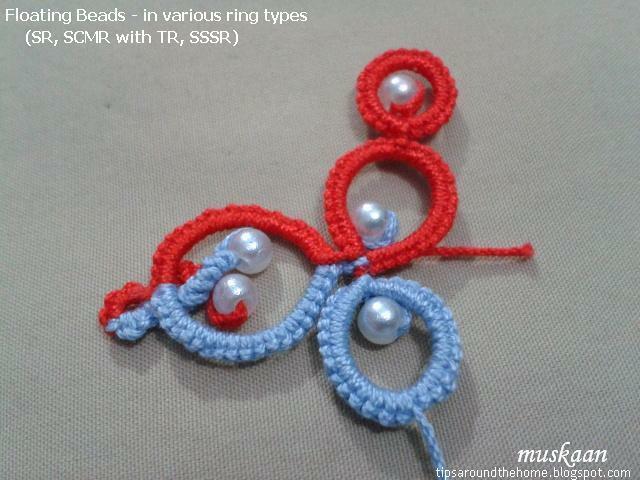 It is a variant of Alternate Thread Tatting (ATT) and Ikuta’s Picots (method 2). I deliberately tried to increase the bare thread space (from 6mm to 7mm), intending for it to look more like a flower. But it didn’t work out properly. This was tatted in a hurry before class, using some leftover threads – wanted to be prepared before attending. Notice the pink thread beneath the cluster on the topmost ring? That is the core thread which lies across the cluster at the back. In this first petal I tried to decrease the space, tugging the ring hard. Wrong ! Close the ring normally and let the bare thread lie behind. Future Idea - Can you see this around a Gem or Penny or a Button – a new Ice Drop pattern? Many many thanks, Usha, for sharing this adorable pattern ! These are a few pics of the Rangoon Creeper just outside my window. I love the flowers and the rapid and luxuriant growth of these climbers (there is a 4-day gap between the 2 pics). We have these on every building in our complex – climbing up a rope right up to the terrace. Every year for one reason or other a climber may fall down. But like Jack’s Beanstalk they grow back in no time !!! DH kept prodding me to cut and put a bunch in a vase and I kept telling him this is one inflorescence that shouldn't be vased - there are always ‘ants’ inside them. Would he listen – Nooooo! So anyways, here’s a bunch on the table. True to modern times, this was a quick photo-op set-up. I was working quickly to avoid any critters showing up – didn’t even wait to properly arrange or for the flowers to straighten out. This was taken only 4 days later. The climber had climbed up out of range ! 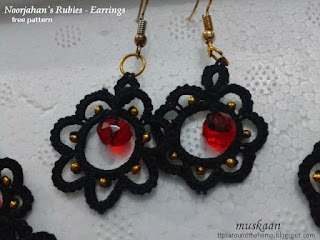 Renata and Justyna take turns coordinating craft series - posting project and tutorial links ranging from tatting, decoupage, sewing, crochet, etc. They’ve already done many such series, and this time it’s back to “I Love Tatting” by Justyna. Every month there is a new sub-topic – plenty of time to learn new techniques or brush up on old ones. And people join in by posting their project and link during that month. It’s a great way to showcase the immense creativity and skills and be inspired by each other. Check out the details here. Georgia is continually throwing challenges my way ;-P And I Love it. Makes me crawl out of my comfort zone. This time it was a necklace for Palmettos goody bag. 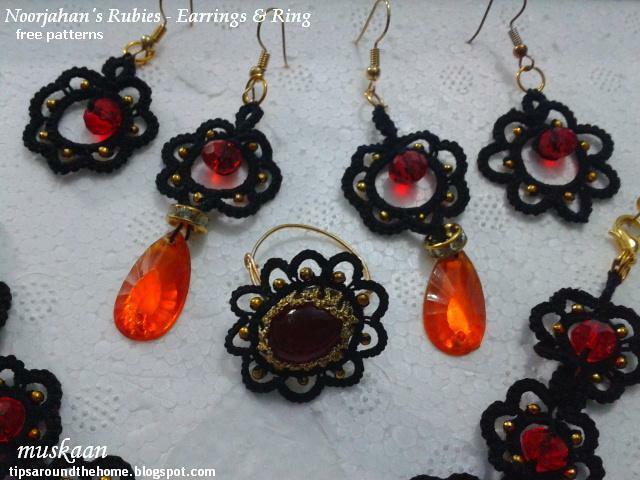 I wanted a set with earrings, too, and at the last moment a ring was thrown in as a bonus pattern. The one great thing that came off it all – a new beading method (Floating Beads). 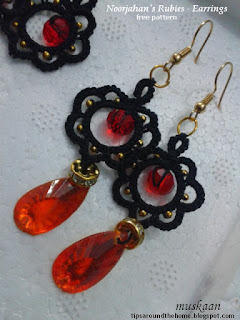 Stephaine Wilson graciously and willingly accepted to test-tat the earring pattern. Her detailed notes, feedback, and input helped tremendously ! 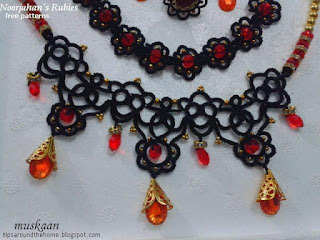 Do you recognize this necklace pattern? 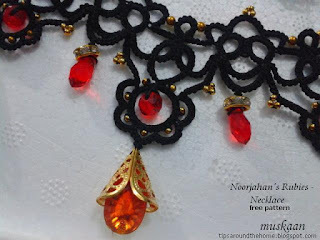 Yes, it’s the vintage edging (#7 from Needleart) converted into a necklace. Barely any changes were required! 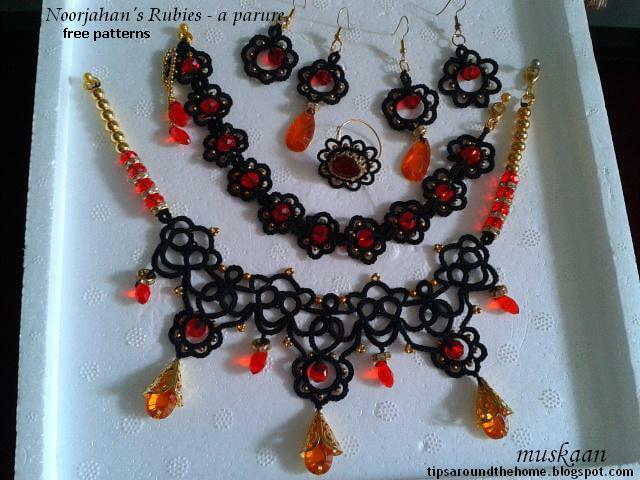 All the other pieces are based off it to make a set – a parure (a term Georgia introduced me to!). When it came to naming the piece, Georgia suggested something ethnic. I immediately recalled wanting to design a ruby pendant after reading “The Feast of Roses” by Indu Sundaresan. There is not much literature on this 16th century empress, but the author has brought her to life. Nothing to it but Noorjahan’s Rubies ! My intention was to use this single large oval bead in the center of the necklace, making the centre large, with more tatted chains around. But it looked too dull there, hence tatsmithed around a ring ! It can also be wrapped around a pin for brooch. And my first time with wire bending ! The ring was a long wire with a loop at one end. I put the straight end through this loop, and then bent it into a similar loop. The ring can now fit any finger. 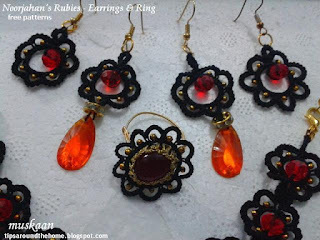 The ring and earrings patterns are shared and explained in this Bellaonline article. The bracelet was tatted while the Tat Days conference was on, hence not a part of the goody bag. This piece has 2 extra 'flowers' - I didn't realise that the tatting would stretch once it was completed and blocked. In fact it Needs to be stretched before blocking. With the extra repeats, it can be worn as a choker ! I’d like to share the design process (what’ll I do with all the pics I took, all the trials I did?! ), but in a future post. There’s always a back story with many by-lanes with learning at each step. I tried to keep beads at a minimum wanting the circles and arches in tatting to show. But I certainly would like to make this in gold thread – it would be truly Indian then. Everyone has heard of the Taj Mahal with it's elegant domes and arches. But it was Noorjahan who first had a tomb built for her father, which later inspired the Taj. Black thread - veil/shadows behind which a woman was expected to remain. 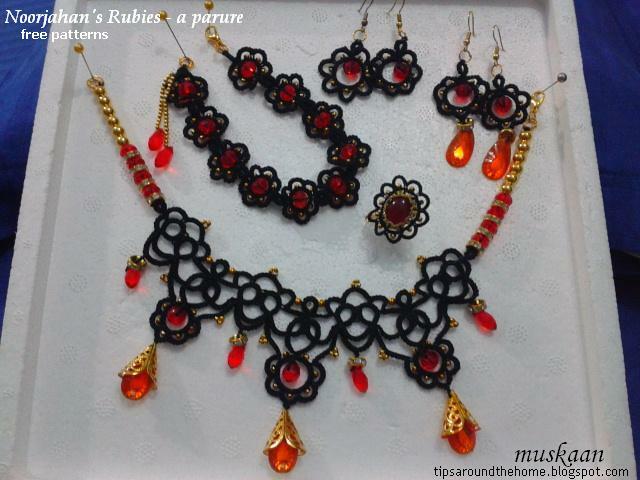 Rubies – for the ruby gifted to her by her husband when he named Mehrunissa “Light of the Universe - Noorjahan” ! Teardrops – for the blood and tears, the resistance and intrigue, yet dignity under pressure. Filigree bead cap – reminds me of the intricately beautiful carvings & inlay work by craftsmen at the time. Diamond spacers & Gold beads – besides prosperity, these sparkling jewels reveal Noorjahan’s brilliance and strength shining through. 4. Noorjahan's Rubies - a parure. Complete 4-PIECE PATTERN written instructions and notations, along with diagrams, and BRACELET download this pdf. Continuing with the doily DIP (design in progress) … the next 2 rounds are tatted ! So Rounds 5 (the 2 lower pics) and 6 completed. Started on Round 7, with Round 8 on the app. I might end soon thereafter. I heartily welcome your thoughts, reactions, and suggestions. Would you be interested in tatting it if I wrote the pattern ? It looks better in person than in the pics. But let me rewind back to last year. It all started on Craftree when a small group informally came together to do a Round Robin. I remained interested throughout, never gathering the courage or confidence to actually attempt anything. And Wow, those doilies are a designer’s dream (and a few of the ladies were first-timers) ! Grace Tan coordinated and updated the thread there and kept encouraging me to take part. She even proposed a RR starting Jan 2017 where we wouldn’t need to send the doily across physically. We could each design a round and share the pattern around. Even though it did not come about, this remained at the back of my mind. Only now something seemed to click and the rounds are coming together… I owe this project to Grace’s faith in me. Want to design your very first doily ? These few pointers might come in handy. In terms of technique, elements, process. There will be plenty of opportunities later to apply advanced techniques or designs. A theme can help maintain focus and reduce our tendency to be too adventurous. My doily has a radiating theme. And I have tried to avoid Reverse Work, tatting clockwise from the front. It makes my work very easy and limits my rambling off. Motif - Zone in on 1 or 2 design elements. eg. Grids. A polar grid for circular projects also helps us see & compare the proportions between old and new rounds, thus reducing trial and error in stitchcount. Apps. I used Sketch Guru app on my tablet to doodle ideas. Upload actual picture and work off it. These are only 2 examples of the many available tools, apps & programs. It helps to think of TWO future rounds so that one has an idea of where joining picots are needed. One can use a fine crochet hook to make the joins, but remember that a picot brings some height to the round/row. Hence estimating whether the entire round will lie flat or the number of stitches required can be flawed. If one cannot think 2 rounds ahead, then have lots of picots in the new round. We can then choose which to join to in new round. What to do with the remaining picots can be decided later in the final version. This is part of staying focused. Once the ‘skeleton’ is ready in the trial model(s), decorative elements such as picots, beads, colours, can be added in later or final version. Check out some fabulous tips on what to keep in mind when designing a doily. Spacing ; Filling v/s Featuring ; Echoing ; Avoid over-thinking (muddying the waters) ; Tablescaping ; Spanning. In the 10 points listed, some are direct inputs from Grace & Ninetta, but it is also a synergy of several cumulative factors and forces over time. How far can I go with designing my first ‘doily’, I’d asked last time? The first 3 rounds with picots and only 6 rings in the central rosette could masquerade as a snowflake, right? But the rosette needs some decorative picots I think. The 3rd round here completely flattens out even without any blocking ! The initial ruffling is a design characteristic - I won't call it a flaw. These 3 round medallions can probably be joined as motifs for a larger fabric. After tweaking, ruffling was tamed, and with light blocking it stays flat. 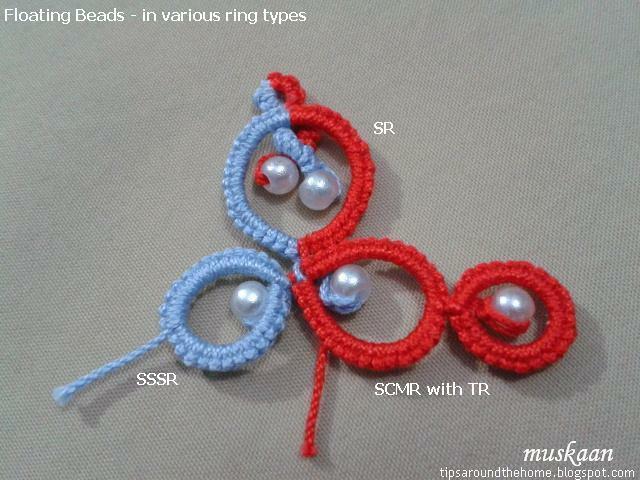 One of the tweaks was to add some bare thread space between central rings. Unfortunately the compactness and slimmer teardrop shape of rings (as in the bronze one) got lost. Should I give it another go ? To maintain the radiating look I nixed any thought of inward facing rings in later rounds. and 5 (4 tatted) rounds…. I used Sketcher Guru app on my tablet to draw rounds 4 & 5, and a rough 6. Have I ever crossed 3 rounds/rows in any of my designs ? Doubt it. My intention is for rounds 4 & 5 to reflect rounds2 & 3. Let’s see. Does the design resemble any snowflake or doily? I haven't copied any pattern, but who knows what's stored in the recesses of my cluttered brain! It’s such a simple pattern after all. I used to dissuade myself from creating a simple pattern especially for a larger piece. But baby steps are important. I’m really excited about this now that it is laying flat. And this is my answer to the question in the Shamrocks pattern. For a hair net/snood, I needed a semi-dense pattern and liked this. However, all except the joining picots have been discarded, for practical reasons when used & washed. Clean, crisp lines of the design become highlighted. No hassle about even picots, picot gauges, etc. Easy to keep track when joining since they are the only picots there. Enhance the lacy, airiness of a piece. Decorative picots come in numerous forms and can add a lot of effect and interest. Picots at regular intervals help us keep track/count of stitches, which is especially handy in case of long chains and large rings ! Since I didn't know the final size, I decided to cut off after each round in order to stop when needed. Techniques used : directional tatting, clover, rosette center, join to the right. The design element that caught my eye was the clover arrangement. Row 3 again has outward facing clovers. (This row was not done, since the size seemed right for the snood). And in Row 2, I really like how the clovers are joined as pairs ! Each round looked very pretty when completed, but I didn’t take pics. Works out to 3½ inch diameter in Anchor size 40. The complete doily will look good in colours to do justice to it’s name. A snood for MIL called for something subdued. Added a Lock Chain string with rings at either end – normal ring and tatting over tails at the starting point, and SSSR tatting over tail for the end. No sewing in ends ! I intend to tat a few more snoods for her in different colours & patterns, once I know for sure that this size is fine. how far can I go ?! In fact this is a challenge I’m setting myself – trying to design a larger pattern. I don’t know how far I can go with it, but this is the very first stage. Already I need to change the picot position in 2nd round so that 3rd round reflects the long ring effect of inner circle instead of oblongs. I'm going to start over tonight to see how it looks. At present there is a lot of ruffling as well. What do you think ? Any suggestions ? tatting simple patterns can be just as exciting ! We ‘met’ in Georgia’s online class. Anita has been a huge supporter and her emails are always so sweet and encouraging! She is so talented – many will remember her corn harvest basket and her miniature tatted baby items. This year she was teaching a class at Tat Days and imagine my immense surprise and pleasure when I got the same pattern in my inbox almost as soon as the event ended! The pattern will be available on the Palmetto’s CD shortly. I am so touched by her thoughtfulness and generosity and treasure her friendship. The triangular motif is repeated 4 times – 2 on either side of the bead, folded back on itself, to create this bow tie. Smart – and interesting how ‘easy’ it is to use flat motifs to create a 3D lace. An alligator join midway through a ring was new to me - stopped me in my tracks! But it’s pretty simple – move the ring thread around/behind keeping the core/shuttle thread in front thus 'capturing' the picot and continue, making certain that thread still slides freely. Use of padding only one half of a stitch is clever (Half Double Double Stitch - HDD)! 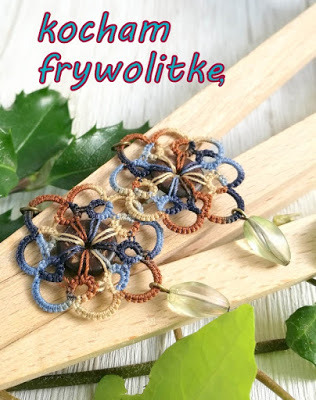 It adds stiffness to the tatting to hold shape, without making it bulky ! HDD is merely one form of a variable/unequal padded double stitch (pds). a HDD would be pds(0,1) ie. regular first half stitch (0 or no wrap), 1 wrap on second half stitch. And if one wanted to make 10 such HDD, we would write it as 10pds(0,1). pds encompasses all the various terms for padding the stitch. Pattern called for a ½ inch bead. This pearl bead is the only one in my stash. However, one can use any sized bead, I realized only later. A smaller bead, more importantly with a smaller hole would keep the 2 sides from 'flopping'. Or perhaps I didn't snug the bead/tatting tightly enough. As a necklace, it wouldn't matter, though. I used size 20 Anchor although the pattern calls for a size 10 thread since I’ve come to realize that the former is pretty close to Lizbeth 10. My bow measures 2”x4” - almost similar to Anita’s. 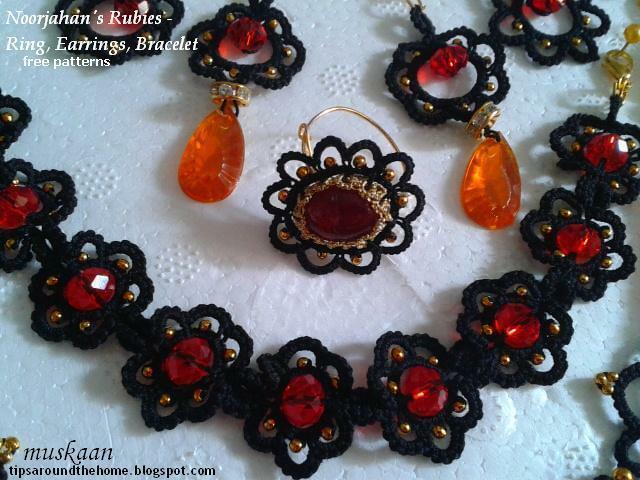 I enjoyed tatting it tremendously & am sure the recipient will like & use it too. As mentioned in earlier post, this bracelet is an application of Jane’s Cascade Earrings pattern. No change in stitchcount of each ring or the process/path. and adding the entire earring pattern too for a bit of width and interest. All in one pass, in size 20 Anchor and 4mm white pearl beads. 7 inches long. Techniques : single shuttle , SSSR - single shuttle split ring,lock join, bead at base of ring. I made a lock join to the bare thread between the rings. This is required because the shuttle is on the farther side of the bead. It was fun all the way !! And I like the gentle colours. Once you get into a rhythm, the pattern flows easily and it is quick to tat up. The bracelet took up a fully loaded Pony shuttle - that would be around 6 yards. In one of my earlier pictorials I mentioned that Floating Beads method can be used in SCMRs, but didn’t actually get around to doing it. Jane’s earrings provided the impetus to take it up again. We make the floating bead first, followed by whatever ring type one wants. It had all started with FB in thrown ring, next in normal ring and now in SR, SCMR with TR, and SSSR. Step 2 – a half knot encapsulating the bead. Since I’m using smaller 4mm pearl beads for these trials, I went with var A.
I’ve used 2 colours to show which shuttle is used to dangle the bead. If you’ve tried the FB method, these pics are self-explanatory. one each from the 2 shuttles. We can have more than 2, of course, as in the tatted Josephine Rings here. Also, I deliberately left a long shank and made several half knots (a Josephine chain) along it. The SCMR is in progress using blue core, and a ring was thrown off with red. Both have a FB. Using blue shuttle only, this SSSR also has a FB inside. Since the bead is floated Before the ring is made, we have a choice of which shuttle to use in case of 2-shuttle tatting. But unlike normal rings, we cannot make a FB After a SR or SSSR is completed because the thread(s) will not be emerging at the start of ring. Hmmm, so can we dangle a bead from the other end ? Oh dear, not another trial ! Actually, though theoretically possible, the bead will not dangle properly. It will have a tendency to flop back towards the next/new element, following the ‘pull’ of the thread. Phew, no more trials ! 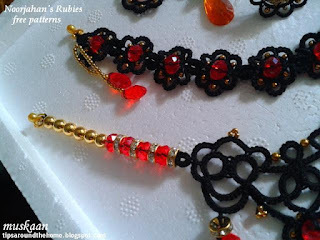 All Floating Beads pictorials in My Tutorials page above.